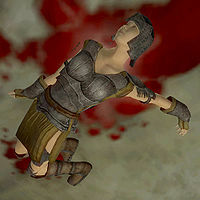 Ariente was an Altmer nightblade and Fighters Guild member who was sent with Viranus Donton and several others to deal with some trolls in Forsaken Mine, south of Leyawiin. Since none of the Fighters Guild members have reported back for several days, Modryn Oreyn is understandably concerned and asks you to investigate what happened. When you enter the cave, it becomes apparent that the routine mission must have gone horribly wrong, as you will find Ariente dead in the very first tunnel of the mine, lying in a pool of her own blood. She is clad in a complete set of iron armor, including boots, cuirass, gauntlets, greaves and a helmet. Trolls of Forsaken Mine: Viranus Donton and some Fighters Guild members were sent to eliminate trolls at Forsaken Mine, and now you must find them. This page was last modified on 25 March 2018, at 02:39.